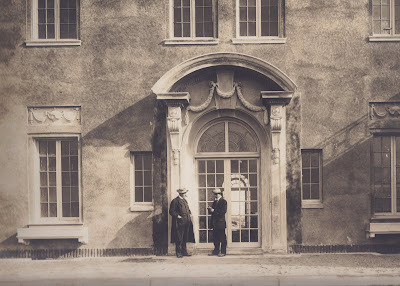 'Chateau Ivor', the Charles A. Gould estate designed by John Russell Pope c. 1908 in Dix Hills pictured just after completion. I'm not sure precisely who the two gentleman pictured are but they give you a good sense of how large the house was. Click HERE for more on 'Chateau Ivor' and HERE to see the brochure from when the house was for sale. Photo from the Gould family collection. Caption might read - Mr Gould writing check to fat-cat builder. Hmmm . . . something doesn't look quite right here ! Those filled-in spaces on each side of the door frame. Appears that the opening was made too large for the frame. Or, perhaps, that a different design for the frame was intended and that a change was made. Hmmm ! Still ~ what a ROOF !!! The club claims the paternity, Old HistoricMapWorks have his name and HistoricAerials show different structure then what is showing today that matches old house. Plus property card still has original sketch of footprint that match how the house would have been. Can anyone confirm this? I was always under the impression he tore down the original Braes at the time he built the new one. This seems very odd and out of place to me. Great photograph Zach! & you’re correct about it giving a better sense of just how big this house was. The detail around the door (I’m sure there’s a correct name for it) is excellent & you can see the impressive vista it had as you entered – this is partly why we still discuss these houses but not houses being built today; these houses just give you so much more to appreciate. Regarding Old Grey Dog’s comment – if you look at the photograph from when ‘Chateau Ivor’ was for sale the shutters have been installed & everything looks fine so if there was a problem it disappeared. By the way Zach – thanks for posting photos that can be enlarged as much as these. About the two gentlemen in the photo – my guess is the man on the left is Charles A. Gould, or his representative, & the man on the right with a notepad is working up a quote for either a) wall-to-wall carpeting, or b) aluminum siding ...(both of which were rejected). Oh, after this grand OLI Ivor immersion of late, my kingdom for a Faces That Match The Estates pic of Gould himself. I'm imagining Gould on the left, he's picking nits with builder on the right, he doesn't like the mullion [minor key] cacophany arising from those of the entry doors being in [slight] conflict with those of surrounding windows, here he is getting ready to make builder an offer he can't refuse. It might be Charles A., himself on the left. Not certain though. It's not an aedicule exactly so I will go with "Door Surround" although it seems like there must be a more complex name. HPHS and Zach: if indeed the Brookville Country Club property had a connection to HLPratt, it would have been to HL Pratt, Jr. Herbert Pratt, Sr., while certainly affected by architectural ADHD (2 Glen Cove houses, 2Brooklyn houses, a New York townhouse sandwiched between three of New York's largest apartments, an Adirondack summer camp and a southern shooting plantation), limited his Glen Cove efforts to the two versions of The Braes. Social Registers of the 1930's indicate that his son, HL,Jr. Lived at a house called Whitehall in Mill Neck. That is the only guess I can give for a Pratt connection. I'm obsessed enough to have called the Club, GM has a framed photo of their original clubhouse and will compare it to photos here at OLI. He said he'll call back. It can't be Jr. because of the early dates involved??? The club took over in the early 20s. Engaged. Herbert Lee Pratt Jr., son of the President of the Standard Oil Co. of New York; to Hope Gordon Winchester of Southampton, N. Y. July 19, 1926. Thanks for the reply Magnus, I thought for sure we here from you about Kiluna Farm Tennis Court. HPHS: having learned in my life "never to say never", I will make an exception and state categorically that Herbert Pratt never lived in this house. Social columns and the Summer Social Register confirm that he lived at The Braes in Glen Cove from the time he built it until his death in 1945. I will be interested in what the Club says, and there may be some sort of Pratt connection somewhere, but it certainly wasn't to Herbert Pratt senior. Sometimes I fear I comment too much, like the know-it-all in school whom we always hated, perpetually with his hand raised, so I thought I would give others a chance on the Kiluna tennis house post. Magnus...you definitely don't comment too much...and any and all input is always greatly appreciated. Anyway...there are only a few around these parts with as much first hand experience as yourself. You 're both too kind. Much appreciated. Be careful what you wish for, as my dear, late mother used to say.